Behavioral health coverage loopholes: Closed! SB 1707 , a bipartisan mental health parity bill, is now the law of the state. The legislation had been drafted with extensive input from the Kennedy Forum and the Illinois Association for Behavioral Health . It had strong support, passing 106-9 in the House and 52-0 in the Senate and was enacted as part of an Illinois GOP response to the opioid crisis. Although a federal mental health parity law has been in effect for 10 years, insurers have often denied payment based on the need for pre-authorization or seen as not medically necessary. The bill, now Public Act 100-1023, takes a multi-pronged approach, by expanding access to addiction treatment, increasing health plan transparency, and improving parity enforcement. It prohibits prior authorization and step-therapy requirements for FDA-approved medications to treat substance use disorders, and requires these medications to be on lowest-tier of prescription formularies. It also requires insurers to submit parity compliance analyses to the Illinois Departments of Insurance and of Healthcare and Family Services, and requires the departments to conduct parity compliance audits. It takes effect January 1, 2019. Rep. Lou Lang (D-16) of Skokie was the bill's chief sponsor. ﻿This summer, the Department of Insurance has also been holding events across the state to inform residents of their mental health parity rights and how to use them. HB 4383 - Ensuring Patient Continuity of Care Act . This new law gives Medicaid managed care patients the right to disenroll from their Medicaid managed care plan if the patient’s primary care provider is no longer contracted with that managed care plan. Signed August 19, Public Act 100-0950 is effective immediately. HB 2624 - The Short Term Limited Duration Health Insurance Coverage Act . The bill would limit these plans to 90 days, ban issuers from discriminating against people with pre-existing conditions, and require warnings that the plan may not provide all needed coverage. HB 4096 - Medicaid single drug formulary . The bill would amend the Public Aid Code to state that the State's preferred drug formulary serves only as a minimum standard, not a restrictive list, thus allowing MCOs to provide stronger drug coverage if they chose. The veto session will start the week after the general elections and be held Nov 13-15 and 27-29. It takes 71 votes in the House and 30 votes in the Senate to override a veto. Early look at Arkansas work requirements - Under new Medicaid work rules being phased in Arkansas, enrollees who are not exempt must engage in 80 hours a month of work or other qualifying activities and report their status online. KFF's issue brief reports that 69% of those affected already work or are exempt, and 29% are at risk of losing coverage. See SPW's post on work requirements creating more problems than they solve. One fewer MCO in IL - WellCare Health Plans' $2.5 billion purchase of Meridian Health was completed over Labor Day Weekend. With a parent now shared by Meridian and former competitor Harmony Health, this brings the number of Medicaid managed care organizations serving the state down to six. (Both CountyCare and NextLevel Health, which became a Medicaid community network in March , serve Cook County only.) We'll be keeping an eye on developments on this front. Rx prices panel discussion - Health News Illinois, an independent, nonpartisan, online news service aimed at healthcare professionals, will host a panel discussion October 3 at MATTER in Chicago on prescription drug prices. See more details and register at Eventbrite . 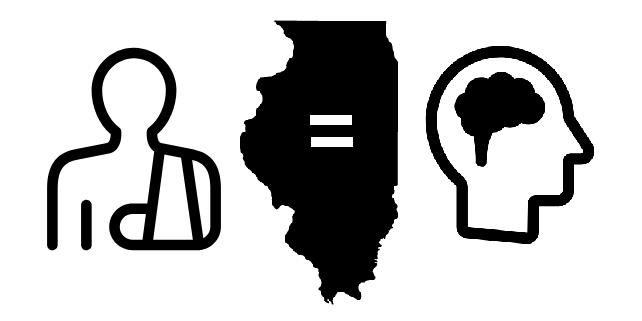 Follow @HealthNewsIll on Twitter for more Illinois health-related news.